I finished the pack on Normal, except for any secret level(s). I'll add my compliments to those above -- this is an excellent level pack, and especially amazing for being your first Galaxy modding production. Overall the difficulty was low, but there were one or two points of fair challenge. There's a tasteful amount of inspiration from the original levels. The flooded level was a neat idea; it looked like it could actually be played as a normal level. Usually I'm in favor of limiting the use of the swimming mechanic, but that level was very good. I look forward to more content from you! I am actually very interested in playing the underwater level without the water! Someone make this into a regular level? Nisaba? there are two underwater levels. which one? na... that would deconstruct the fun. just use your imagination! but if you really want to, simply jump into Abiathar and replace Keens swimming sprite with the walking sprite. easy as that! Woo started playing, I'm 5 levels in, more tomorrow. I really like humor in the story and the in-game messages (lol the wetsuit). I really like that you demonstrate mastery with how to use the tiles to create scenes, and I really appreciate how often you use slopes and ledges to break up the movement and action (but remember its ok to just have an area that's flat!). So far I've found the levels slightly easier and somewhat shorter than the originals (I'm playing on normal). One thing to watch out for in the future is making the level too similar to the original you're replacing; maybe it was on purpose since the Sunnylands seem to mirror the Shadowlands somewhat, but I noticed immediately that the first three levels played out similarly to the original levels (maybe this is why I found them easy too, the familiarity). @Ceilick: The reason why I usually use slopes and ledges in some levels was because I wanted the natural levels (like the grass ones) to feel like they were made naturally and not like they are built with a bunch of blocks together. The man-made levels (like the pyramids) are intended to feel more angular and block-based. 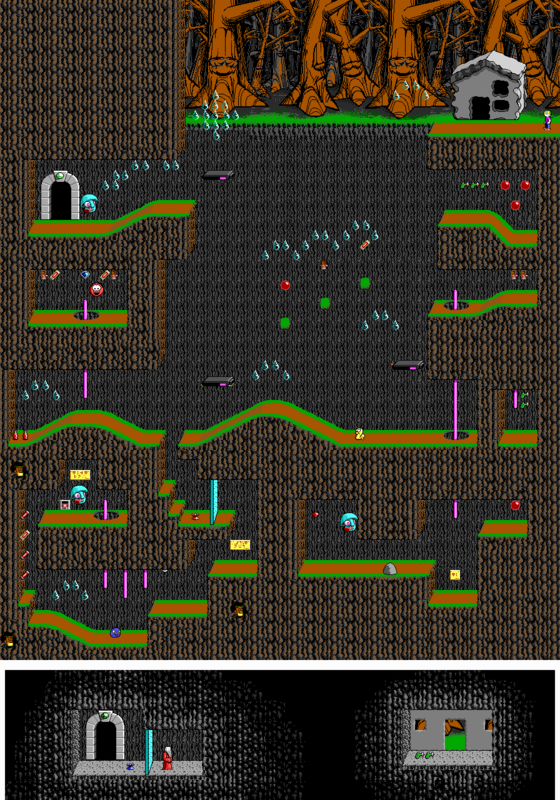 I do agree that some levels feel too similar to the originals, which wasn't really on purpose, I think. I don't think I came up with the world name until I made a few levels; it was called Sunnylands since I couldn't think of a better name that would fit. Just finished, I really enjoyed playing! The story, while simple, has such great, keenish humor in it, great job! I'll echo others who have praised the sunken fort; what a unique take on a water level, really great. I really struggled to find the yellow gem so that I could get to the secret level! I found it on accident after wondering around for ten minutes lol. The level design, as I mentioned earlier, is pretty consistently good throughout. Again, really liked your use of slopes and ledges to create really organic, keenish feeling areas with great point item distribution. One thing I noticed while playing, which was a small negative, is that sometimes I didn't feel like I was exploring so much as just following the path in front of me. Part of this was because the levels usually felt small (the opposite problem that most of us have designing levels). I think having more open areas where the player needs to figure out the right way to go would help. I never felt there were too many slopes. In Galaxy designs I like to see a lot of them. I'm on mobile so can't pull up some images on Sunnyland levels to illustrate what I mean, but I definitely don't want to be understood as advocating significant complexity (if Keenrush is responding to my suggestion). Take a look at Slug Village or the Perilous Pit. Both these levels have great use of slopes and ledges breaking up the flat space, they also have some nice flat areas that stretch the level out to be a bit bigger without increasing complexity, and they also have areas to explore and room to figure out where to go (even if there's only one or two moments where they have to do so). Sunnylands certainly did have some levels that felt this way, for me. In a couple of levels I even stumbled upon the exit before I was done exploring and turned back to investigate the areas I missed! That was a really good feeling: not feeling like I needed to escape due to difficulty or over complexity. @Ceilick: It's really nice to see that you enjoyed it! About some of the levels feeling linear, if you're talking about the secret level and the hand pyramid, those two levels were meant to be like that. If you're talking about other levels, though, then I'd like it if you have showed me what you mean. Also, it feels really great to see that you're hoping I'll do a levelpack for Keen 6! @Shikadi-Network: Huh, that sounds very weird. The mod should be beatable without needing to even go to the secret level. Did he play all of the levels? If so, then I'm guessing there's a bug in one of the Council Member levels that let you exit without getting the member. If it's not because of bugs, then could he perhaps send me a save file of his, if he does have one, so I could look into it and see what's wrong?